Welcome to the August issue of our newsletter. If you'd like to have each issue delivered to your email address you can sign-up for a subscription. While there's still a month of summer left check out our list of a few book recommendations for your summer reading. These are picture books, novels and nonfiction titles which have moved us the past year. Summer Reading. September 9, 2002 - St. Rocco's Club, Westfield, MA. Sept 24-27, 2002 - Kentucky Rural Librarians Convention, General Butler State Resort and Park, KY.
October 11, 2002 - Columbia, SC. October 14, 2002 - Teacher-In-Service, Henrico County, VA. Featured Subject: Buildings and Architecture in Children's Books. Featured Book: A Single Shard by Linda Sue Park. Featured Subject: The Great Depression in Children's Books. Featured Subject: US States in Children's Books. Featured Subject: Wind in Children's Books. Copyright 1996-2017, Rebecca Otis. 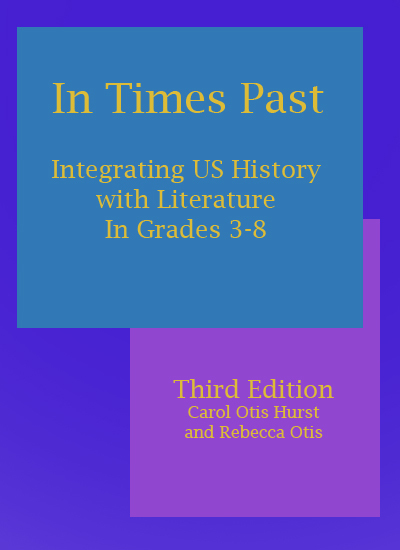 This document is from Carol Hurst's Children's Literature Site, BooksInTheClassroom.com at http://www.carolhurst.com.